The Republican-dominated Ohio House will consider a bill that would ban abortions after 24 weeks, or 22 weeks if the fetus is "viable." It would also allow exceptions "if the physical health of the woman is at serious risk but specifies that does not include a condition related to the woman's mental health." 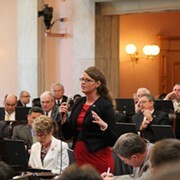 House Bill 7, which is sponsored by Democrat Lorraine Fende, is one of the priorities of the Ohio House Republicans and would put Ohio alongside 38 other states that have some legal restrictions on late-term abortions. 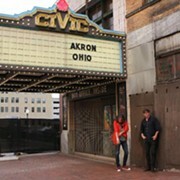 Ohio once had a late-term abortion ban, but that was struck down by the courts in 1997. "There have been a lot of court cases that have come down the pike, and we believe the climate is right now both judicially and legislatively to put this forward," said Michael Gonidakis, executive director of Ohio Right to Life. 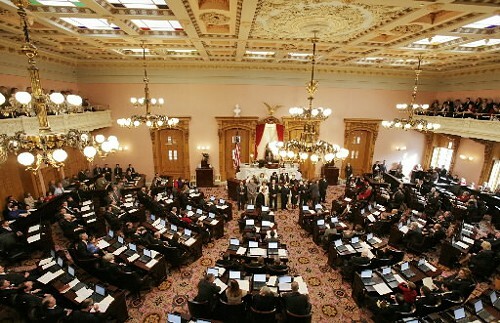 If passed, Ohio would join 38 states with some type of limit on late-term abortions. Its prospects should be good; Republicans have huge majorities in each chamber, and a few Democrats were endorsed by Right to Life. The issue is a "bait and switch" for Ohio voters, said Kellie Copeland, executive director for NARAL Pro-Choice Ohio. "They voted on jobs and the economy, and now they're getting divisive abortion legislation." Those decisions belong with women, their families and their doctors, she said, adding that the bill would ban abortions during weeks when serious complications can arise or information about fetal abnormalities can become available. The bill's health exception "ignores so many other serious health situations that we feel strongly the bill, the way it's crafted, marks a serious threat to women's health," Copeland said. According to the article, 28,721 abortions were performed in Ohio in 2009. Plenty of possible counter-proposals are bound to be discussed as the contentious bill is considered.